Yes, this cocktail is for real, and it’s a delicious (and cheap!) one at that. The Krungthepmahanakhon Amornrattanakosin Mahintharayutthaya Mahadilokphop Noppharat Ratchathaniburirom Udomratchaniwetmahasathan Amonphiman Awatansathit Sakkathattiyawitsanukamprasit — known as the “Krungthep” for short — could even be considered the house cocktail at Qi, Pinchet Ong’s pristine new temple to Bangkok-style Thai, as that string of indecipherable words is a name for Old Bangkok, more than one server confirmed. 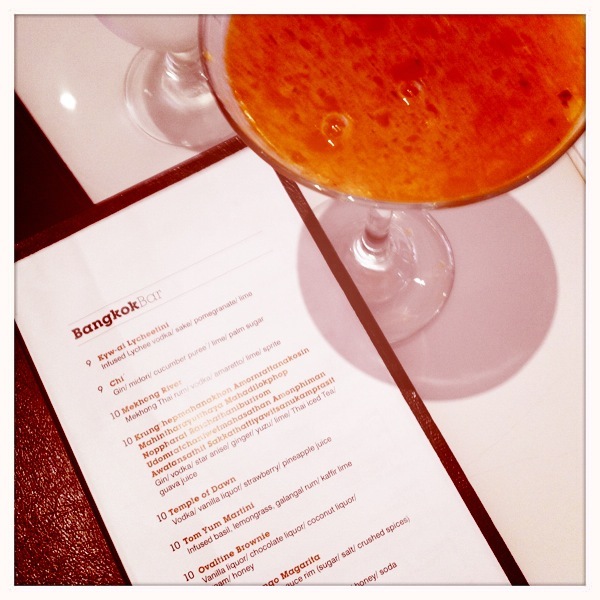 Qi Bangkok Eatery, 675 Eighth Ave., btwn 42nd and 43rd sts., 212-247-8991. … might have ended there, as well. Now that I think about it. I also shared part of a friend’s taco plate, but surely didn’t eat enough to even say that we split it. Oh well, sometimes festivities get the best of you! From what I did taste, Festival Mexicano Restaurant in the Lower East Side has passable Mexican food — there’s much better options elsewhere in the city; a personal favorite of mine is Florencia 13 in Greenwich Village, not street-cheap, but restaurant-quality. The margaritas at Festival Mexicano, on the other hand, were frothy, cheap ($5 well, $7 Sauza Hornitos, 100% agave tequila) and wicked strong.